The 2011-2012 Waterfowl Pictures Thread! Decided to try again anyway since it`s the last week for us.....and was rewarded!!!!!! Scraped a few birds this morning.. Yes that's a Poodle and **** no it's not mine, it's my buddy's. Nothing wrong with a Standard Poodle. Prolly outwork half the other breeds on the marsh. 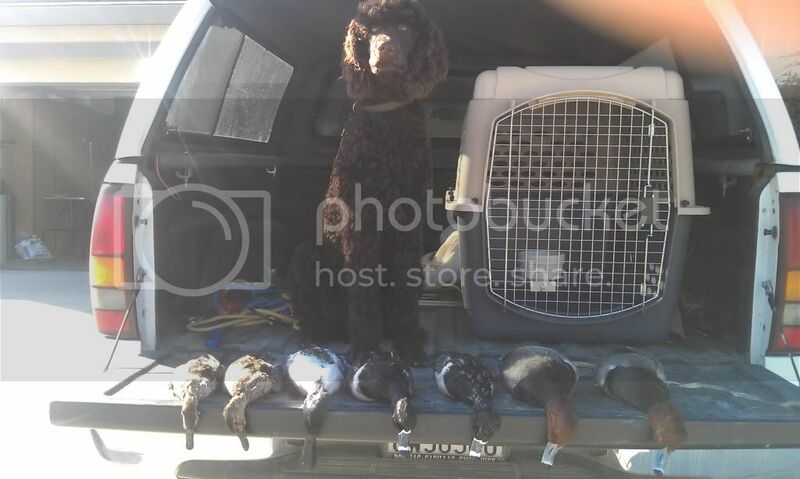 Nice birds mudhen, I hear its been either a hit or miss up in the rice this year..
Had a great last weekend! I forgot my tote to hang them up, but we ended up with 3 greenwings, 3 greenheads, 2 suzys, 1 gadwal, and 3 squealers!